Reverend Ernie Cox has been entertaining Ottawans with his piano since the heady days when Sneezy Waters and Bruce Cockburn were learning their trade in these streets. In recent decades his gospel sound has found him a huge audience, particularly at Christmas at the NAC. This is your rare chance to see him, Lynda and the London Trio plus - his musical family - in an intimate setting, glorifying and pleasing the Lord with their combined talents. Several times he has honoured Good News Christian Ministries with spirit-led fundraising concerts, and this will be no exception. We are particularly pleased to host this event at Sunnyside Wesleyan Church, where one of our four preachers, Brent Russett, is the senior pastor. ​After the concert there will be refreshments and an opportunity to mingle with listeners, preachers and members of the GNCM board. Do you have friends who you think would enjoy listening in to Good News in the Morning, but are not yet doing so? Why not invite them to join you for this evening of joy and fellowship. 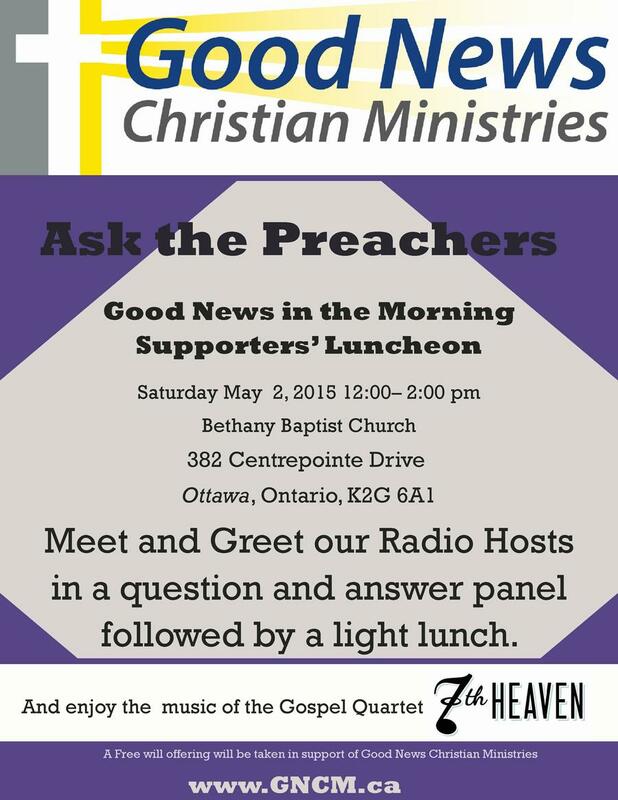 It's your ideal opportunity gently to introduce them to the radio program - which might be their salvation, literally. Dr Rick Reed, President of Heritage College and Seminary, and former senior paster of the Metropolitan Bible Church, Ottawa, was our esteemed speaker at this event. Many came out to hear him, and to meet our radio preachers personally, and enjoy the music of Redeemer Alliance Worship Team. Free admission and a goodwill offering for the benefit of Good News Christian Ministries. Rev Donald S Crisp, R.I.P. We regret to report that a great servant of God and regular presenter on the Good News Christian Ministries broadcasts has been called home to be with our Lord and Saviour. Pastor Don, affectionately called “Don the Baptist” by his friends, will be sorely missed by the many listeners to the ‘Good News in the Morning’ radio broadcasts (6:30am Sundays on CFRA), and around the world through the internet. Our deepest condolences to Don’s wife, Tricia, and the Crisp Family. Farewell, Good Friend, Until We Meet Again! See Blogspot for 12 Aug 2012.